The wait is over for fans throughout the galaxy! 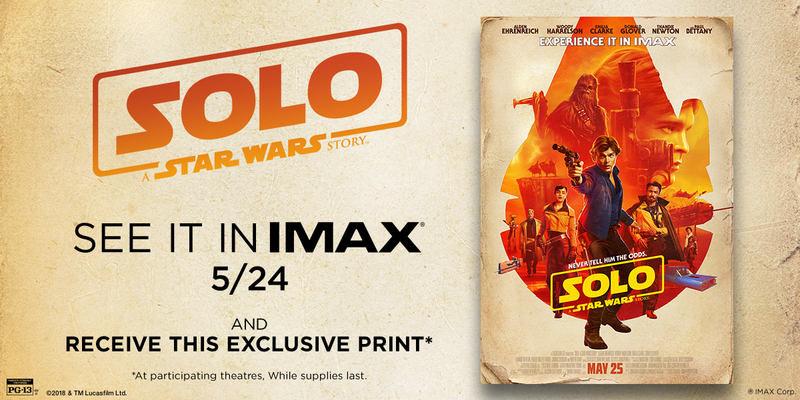 Tickets to experience Solo: A Star Wars Story in IMAX are on sale now. 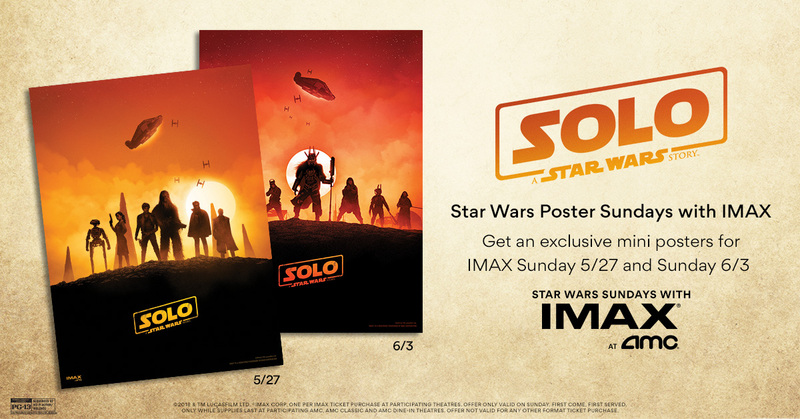 On Sunday May 27, and Sunday June 3, guests who experience Solo: A Star Wars Story in IMAX at AMC Theatres will receive one of two exclusive prints from artist Marko Manev. Collect them both! Available while supplies last. 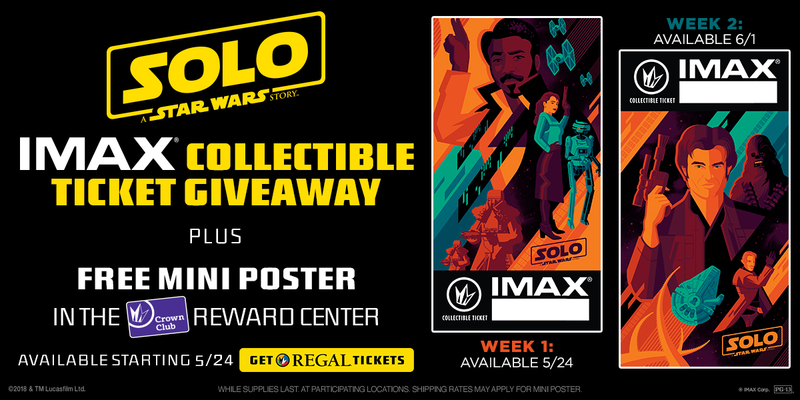 Fans who experience Solo: A Star Wars Story in IMAX at Regal Cinemas starting May 24 will receive an exclusive collectible ticket featuring art by Tom Whalen. See it again starting June 1 to receive the second exclusive collectible ticket to collect them both! A poster version of the collectible ticket art will be available to IMAX guests in the Regal Crown Club store. Available while supplies last. Be among the first to experience Solo: A Star Wars Story at Opening Night Fan Events in select IMAX theatres. In addition to watching the film one hour early, fans attending will receive commemorative giveaways and be given a special event only concessions offer. Amstar Cinemas, Brenden Theatres, Celebration Cinema, Cinemagic, Cinema West Veranda LUXE Cinema, Cinemark Theatres, Cineplex, Cinémas Guzzo, Cinépolis Luxury Cinemas, CMX Cinemas, Cobb Theatres, Frank Theatres, Galaxy Theatres, Goodrich Quality Theatres, Grand Theatre, Harkins Theatres, Landmark Cinemas Canada, Malco Theatres, Marcus Theatres, Megaplex Theatres, NCG Cinema, , Penn Cinema, Premiere Cinema, RC Theatres, Reading Cinemas, Royal Cinemas, Santikos Palladium IMAX, Showcase Cinemas, Showplace Cinemas, Southeast Cinemas, The Grand Theatres, New Vision Theatres, TCL Chinese Theatre, Bullock Museum IMAX Theatre, IMAX Theatre at The Minnesota Zoo, Esquire IMAX Theatre, IMAX Theatre at Tropicana, Smithsonian Udvar-Hazy Center IMAX Theatre, Smithsonian Lockheed Martin IMAX TheaterAutoNation IMAX Theatre, IMAX Theatre At Marbles, Pacific Science Center IMAX Theatre, Challenger Learning Center IMAX, Branson IMAX Entertainment Complex, IMAX Theatre at Indiana State Museum, World Golf Hall of Fame IMAX Theatre, Natick Sunbrella IMAX Theater and Reading Sunbrella IMAX Theater.